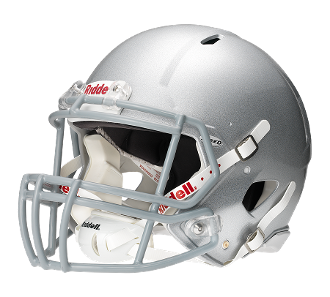 The Riddell Speed Icon Adult Football Helmet is setting the standard for evolution of the football helmet. Continuing its long standing reputation for superior protection, the Speed Icon Helmet uses the popular offset shell design demanded by players for that extra boost of swagger on the gridiron. Adding on to all the great features of the Speed helmet, the Icon boasts a lighter facemask and upgraded liner which enhance speed, comfort and protection. The inflatable S-Pads in the jaw are made to provide a custom fit and dissipate impact along the jaw line. The upgraded quick release clips allow for easy changes to the facemask and acess to the face, so you can up your swag with a new facemask or visor in minutes!